Roger Mayer's guitar pedals has a long list of fans worldwide and now he has announced The Roger Mayer 456 which allows you to add the sound of analog tape to your workflow without the hassle of purchasing tape or constantly aligning or performing tape machine maintenance. "It uses the latest ultra-high speed analogue design techniques to accurately duplicate the dynamic and harmonic properties of analogue tape and vintage tape recorders in real time with zero latency or any other time smearing artefacts. 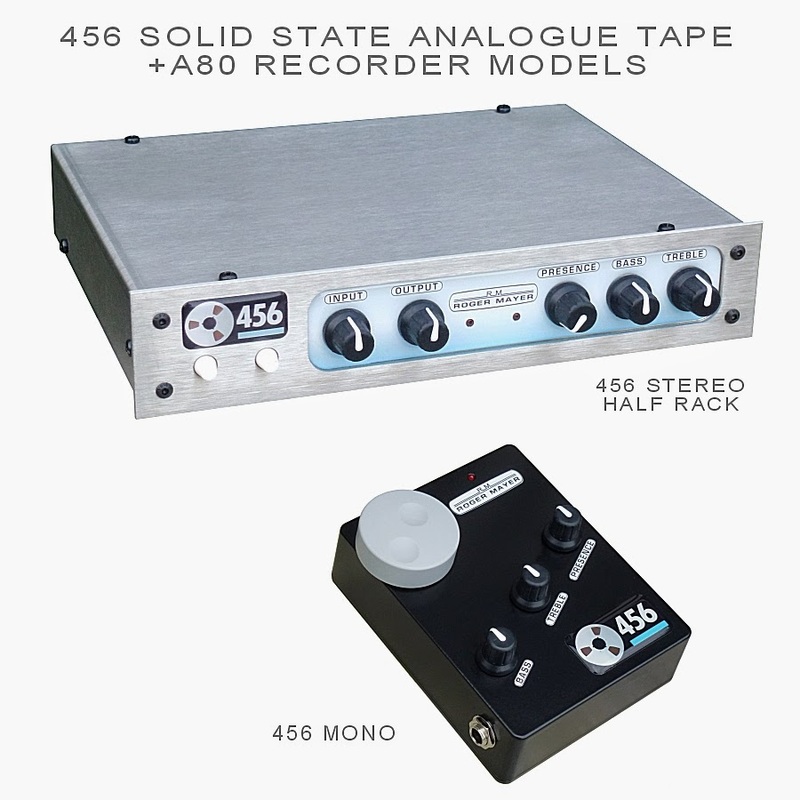 456 Tape was chosen as the model for the harmonic and dynamic properties and the A80 Studer Tape Recorder as a reference for overall frequency response with respect to tape speed, bias and tape head properties." "I did a lot of listening tests, comparing the 456 with various plug-in tape emulators and saturation devices, and I've come to the conclusion that Roger is definitely onto something, as I couldn't quite replicate the sonic character of his box using any of my plug-ins. Which comes closer to actually sounding like tape is another discussion altogether, but when it comes to achieving what you really want tape to do (rather than what it sometimes actually does! ), the 456 is extremely effective, producing musically satisfying results. For examples, real tape can't handle cymbals at high levels because of the pre-emphasis used in the recording chain, whereas Roger's circuit has no such limitation. Drums can be made to sound big and punchy with an apparently different sense of air around the sound, even at lower drive levels. Bass guitar also benefits, sounding somehow fuller and better able to sit in the mix. " "For stereo processing, I tried a pair of 456s via my DAW's main mix insert point and used the DAW's 'jellyfish' meter to ensure the left and right balance was the same as with the insert point bypassed. I also set up the DAW so as to maintain the same level when the insert bypass was operated. As with analogue tape, there's a sense of cohesion: mix elements feel better integrated, while the low end fills out somehow, without actually getting louder. Certainly, the forthcoming stereo model will be better suited to this role, and the lack of an output level control here made it harder to balance the levels for A/B checking, but it didn't take long to get good results. Because of the format of this particular box, I'd say that it's most useful for tracking, where it can soft-limit peaks before they hit your converters, or to insert on individual channels for processing during mix down." Read the rest of the Peter's article on the Roger Mayer 456 here. The 456 Mono is $299. The 456 Stereo will be shipping shortly. Price TBA.